The The Buffet is a restaurant inside MontBleu Resort Casino & Spa in Stateline, Nevada. Had the additional lobster tail. It was delicious. Good variety, prime rib wash great. Made a huge salad. They had everything I liked. The sugar free cheese cake tasted like the real thing. One of the best buffets ever. Great variety, delecious taste and a lot of food. The reason I gave it 4 stars is that the waiting line was so long. It was friday and it took us about 40 minutes in the line to enter the restaurant. This is the 5th time visiting the Forest Buffet, also the first time I feel the need to complain. The food and wait staff were awesome. The hostess not so much. Rather rood, snappy and took for ever to assign a waitress. Once we had a waitress she was great. The food as usual was great . Step it up you owe it to yourselves. I won't be eating here again. Its run down and lacks the proper leadership. To have such an amazing location you would expect quality at every turn, attention to detail, but what do tourist know right. The service and food was good. I enjoyed the view from the window front. 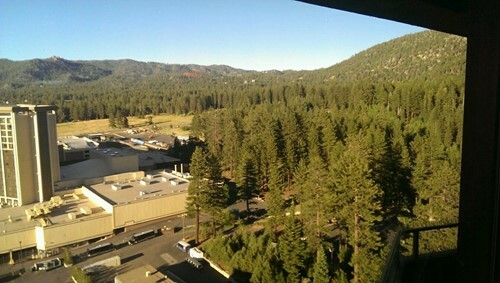 On the 18th floor of Harrah's in Lake Tahoe, this buffet offers the best in food, service and views. Friday night had always been my favorite. It's seafood night. Oysters on the half shell, shrimp and crab make it difficult for me to get to the rest of the fare which features hand carved, tender and flavorful, prime rib. Highly recommended. The crowds can be overwhelming at times so do some research before showing up. What a fantastic place to take family&friends for dinner. Food there is delicious and lots to choose from. Nice buffet on the 18th floor of Harrah's Casino and Resort in Stateline NV. Great food and lots of it. Good price as well. NO BABY CHANGING AREAS! For parents to know. And the food is just ok. And for the price...pass. Not the worst food. Desserts are good tho. Fresh crapes made in front of you. A pretty solid northern Nevada buffet with a top notch view. Enjoyed the crab, prime-rib and a good dessert selection.